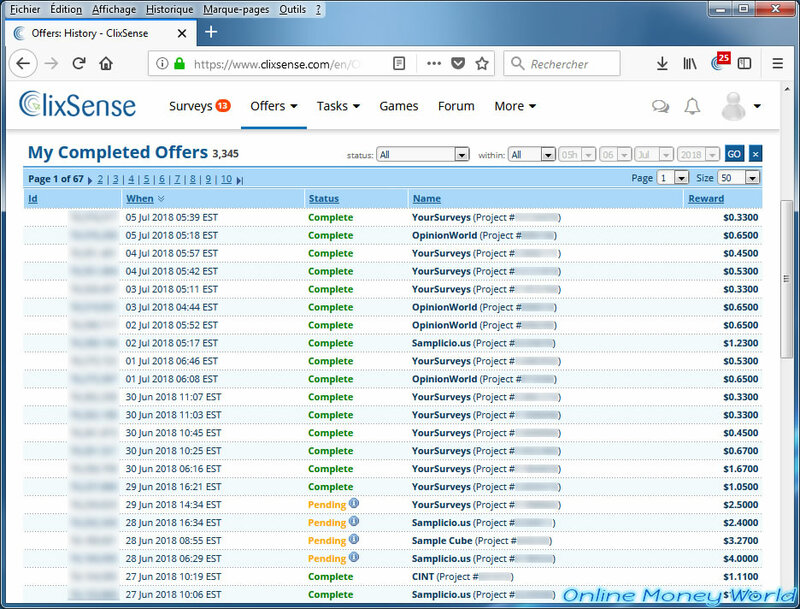 Clixsense is a trusted paid site created in 2007 and that allowed you to earn money through paid clicks (PTC). If you don't know how Get Paid To (GPT) sites work, refer to my article : How Get Paid To (GPTs) sites work ? To begin, here is an overview of my Clixsense account on July 6, 2018. 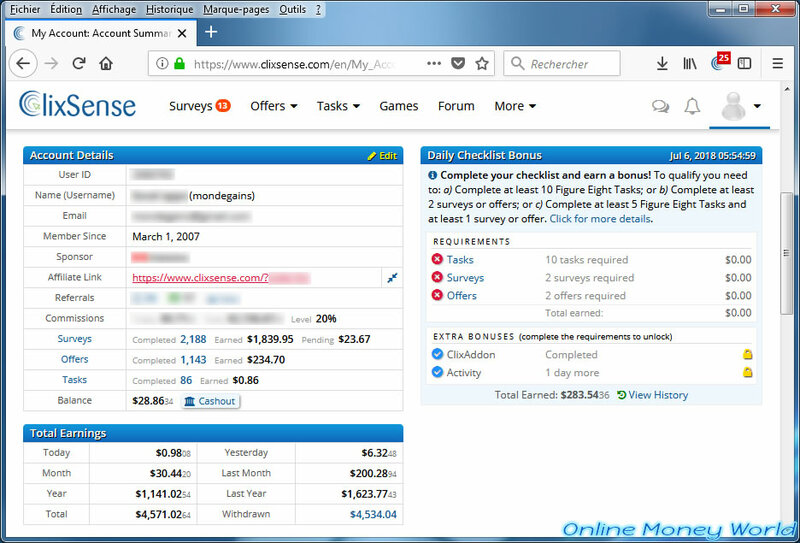 As you can see, Clixsense is a very interesting trusted site that could make you rich if you are active every day and you complete your bonus every day. the paid tasks are interesting only if you are very comfortable with English. In fact, you will be able to level up at Figure Eight (CrowdFlower) and finally get very high paying jobs. 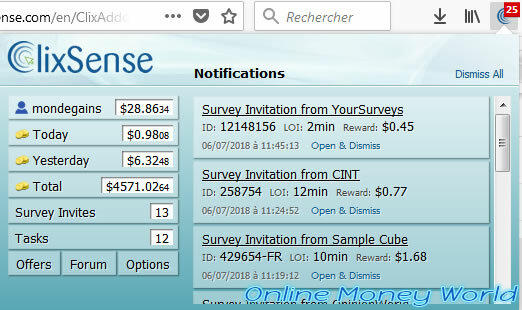 As you can see, Clixsense offers many surveys every day (thanks to many providers : YourSurveys, OpinionWorld, CINT, ...) and offers you very good remunerations. 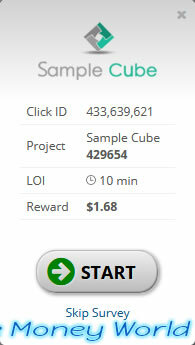 In addition, their partnerships with Samplicio.us and Sample Cube allow you to get up to $ 5 per survey. These very good surveys can allow you to earn money very quickly, but are very often subject to a manual validation taking 30 or 60 days. Nevertheless, I have always been credited for these polls. Important : you must answer the questions seriously and taking your time. To avoid making "novice" mistakes in paid surveys, read our full article first : How survey sites work ? In the "Surveys" section, you will also find "routers". 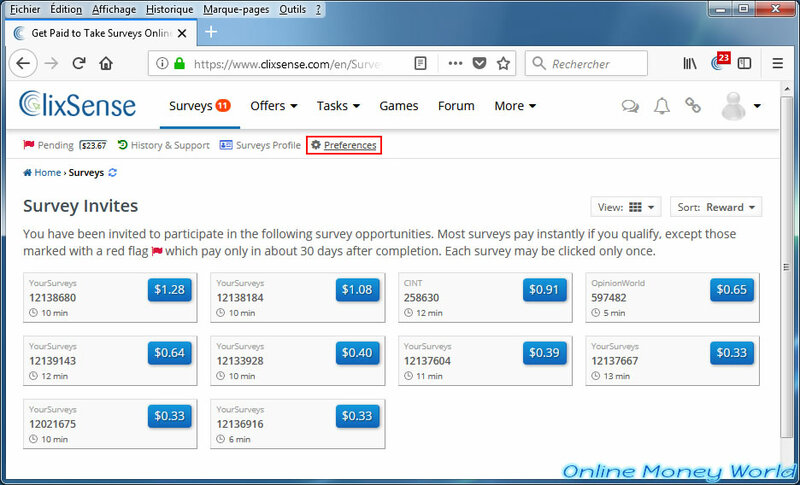 This allows you to complete a maximum of surveys from different survey providers (such as : OpinionWorld, Speak Up, CINT, ...). For this type of survey, the remuneration will be always the same. Which is advantageous most of the time. Since very good surveys are becoming more common (especially if you've been active on Clixsense for several months and you still seriously completing paid surveys), your pending balance may skyrocket. No worries, you will receive your earnings in 30 or 60 days as planned. If you click on the "Pending" link, you will see when you will be credited for the various high-paying surveys. As you can see, I have several pending surveys that are paid between $ 2.40 and $ 5. Which makes me a total of $ 23.67 for only 7 polls. Once you receive your earnings, you will receive a "Pending Survey Credited" notification directly into your Clixsense account. In rare cases, the reward for a survey may not be automatically credited. In this case, Clixsense will credit you later and you will receive a "Missing Survey Credited" notification. 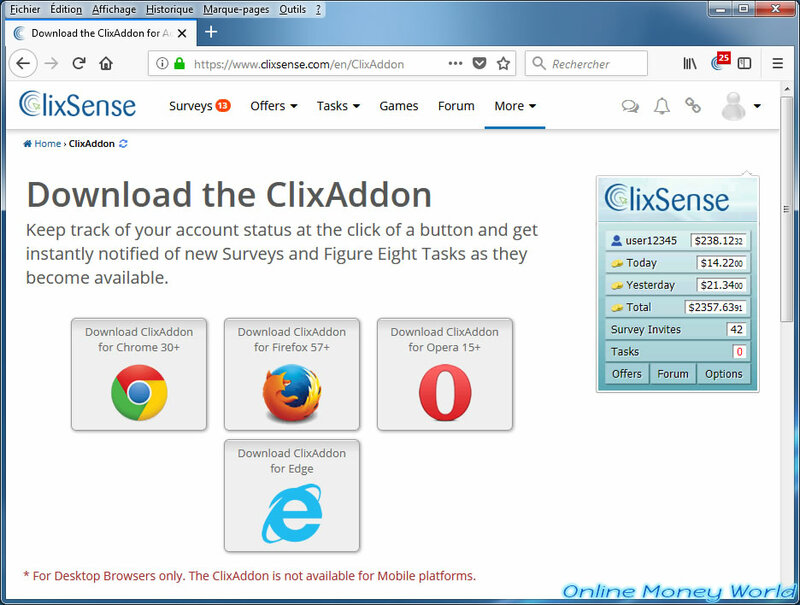 To maximize your chances of being able to complete surveys (and $ 2, $ 3, $ 4, or $ 5 surveys), I strongly advise you to install the Clixsense "ClixAddon" extension available in the "More" section of Clixsense. In addition, this extension is essential to complete the daily bonus which I will talk about a little later. 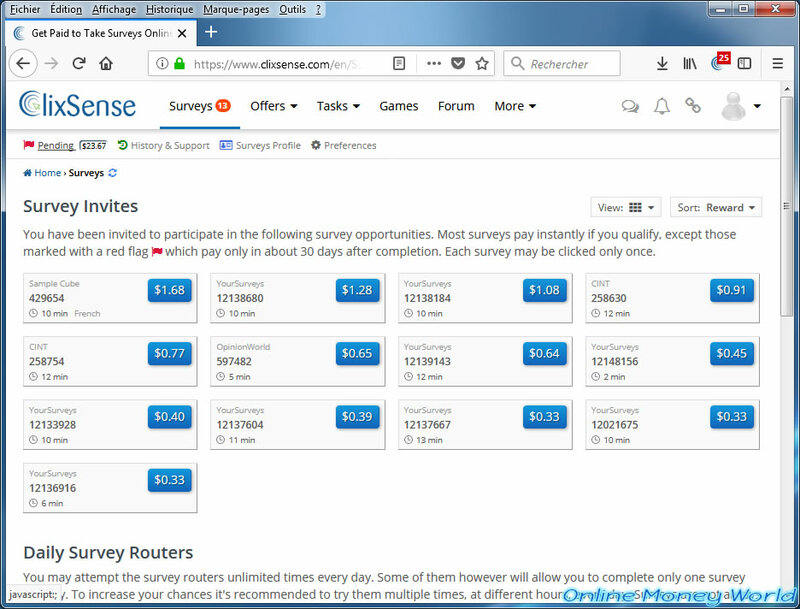 Thanks to this extension, you will be notified in real time of the availability of new surveys on Clixsense. This is very important because you are much more likely to be selected by participating directly than waiting hours before clicking on the invitation. Note : this will prevent you from receiving the "Quota full" message which means they have enough participants for this survey with the same profile as you. As previously explained, the daily bonus allows you to earn up to 16% bonus based on your earnings of the day. This daily bonus allows you to earn a small bonus per day or a BIG bonus if you have completed high-paying surveys ($ 2, $ 3, $ 4 or $ 5). You are convinced ? So, read the rest of this article to maximize your chances of making money on Clixsense. As I already explained in detail in my previous article "How survey sites work ? ", completing your profile is essential to start making money with paid surveys. To complete it, go to the "Surveys" section of Clixsense and click on "Surveys Profile". As indicated by Clixsense, it's very important to answer correctly and honestly to the questions asked to complete your profile. In fact, the answers given in paid surveys should be identical to those given here (for the profile). Note : they will not check at home, but if you give false answers, it will be difficult to give the same answers in the polls. And then, it's important to tell the truth so that the surveys can match you. Tip : take a look at this. Important : after validating your answers, they will be locked permanently or temporarily (for a longer or shorter period) depending on the issues involved. To earn money from paid surveys, it's important to be among the first to participate. This allows you to increase your chances of completing them. 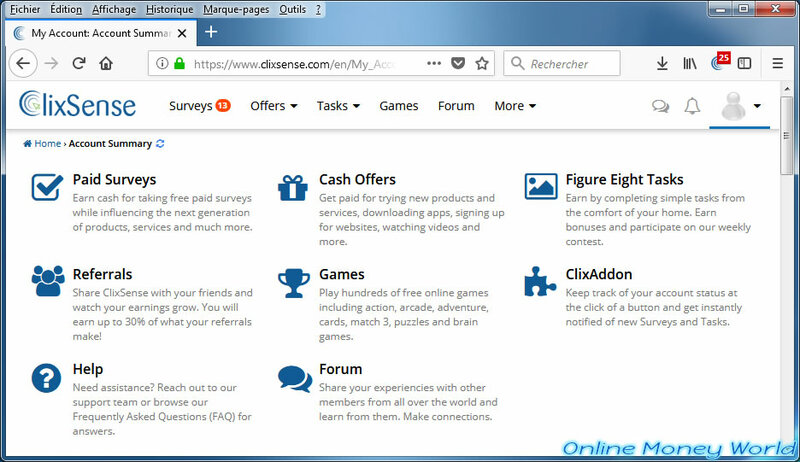 For that, the first thing to do is to install their ClixAddon extension from the Clixsense More menu (as explained above). Then, I also recommend that you enable real-time notifications via email. 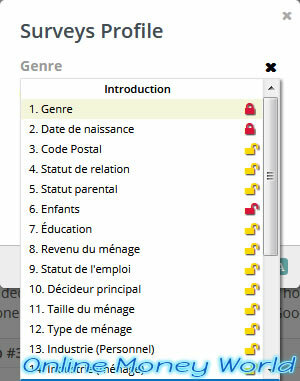 For this, in the "Surveys" section of Clixsense, click on "Preferences". Enable surveys for the following devices : Smartphone and Tablet. 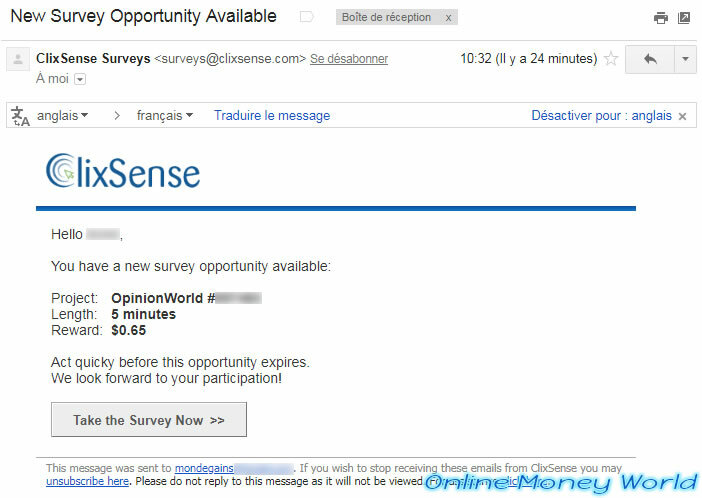 When a new survey is available (as an invitation), you will receive a "New Survey Opportunity Available" email directly from Clixsense. Note that not all surveys are notified by e-mail. It's for this reason, I recommend that you use both methods (e-mail notifications and the ClixAddon extension). To access the survey, click on "Take the Survey Now". Log in to your Clixsense account if you have not already done so, then click on the "Start" button that should have appeared. 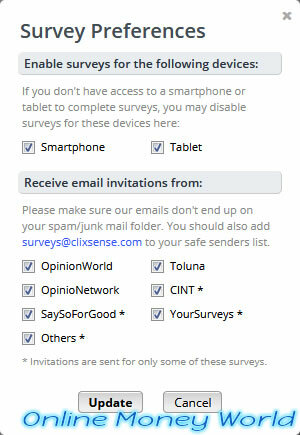 Otherwise, go manually in the "Surveys" section of Clixsense to find the invitation to this survey.